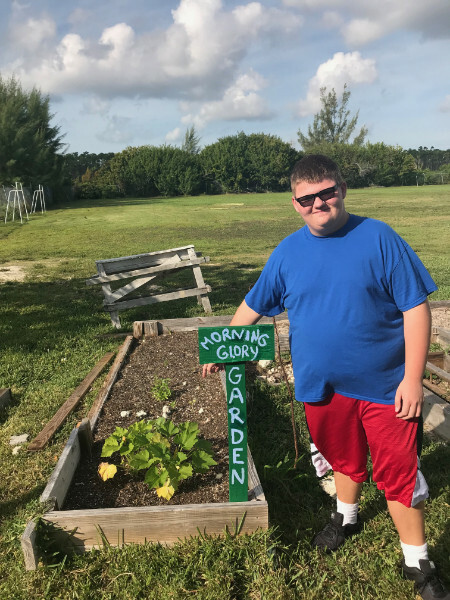 Freeport, Grand Bahama - Students of Bishop Michael Eldon, Freeport Gospel Chapel and Lucaya International Schools are leading the way in protecting their environment through the Eco-Schools Bahamas Programme (ESB) on the island of Grand Bahama. 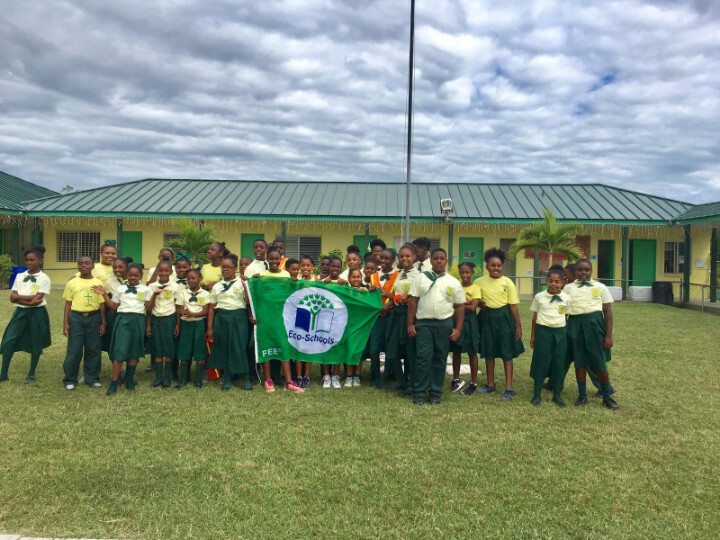 On Tuesday 27th November 2018, Bishop Michael Eldon School achieved its second esteemed Eco-Schools Green Flag Award and Freeport Gospel Chapel and Lucaya International Schools were awarded their first prestigious Green Flag Award after undergoing onsite evaluations by Eco-Schools Bahamas Assessment Teams. The Green Flag Award is the highest award level that a school can achieve through the ESB programme and can be granted every two years. All three schools met the award criteria and exceeded expectations in several objectives set in their environmental action plans. “It has helped us to maintain a clean environment, reduce energy consumption and heightened conservation awareness in our students,” said proud Principal, Mrs. Rickelle Albury of Freeport Gospel Chapel School (FGCS) while commenting on the benefits of the Eco-Schools Programme. 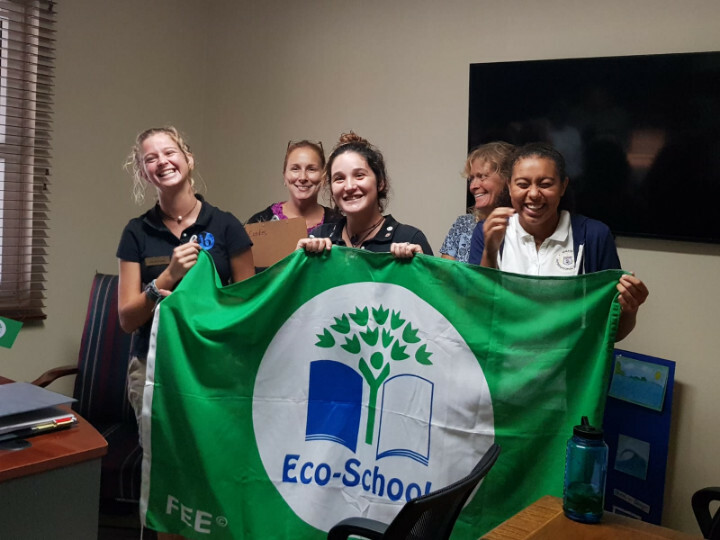 According to Lucaya International School’s Eco-school Adviser, Mrs. Erin Cordes, "Receiving our Eco-School green flag means a lot to Lucaya International School. Our students, especially our Eco-committee, have been putting a lot of effort into reaching our goals and we will continue to work on this initiative. It is so important to educate our community as a whole, starting with our youngest people, on why it is critical to care for our environment." Dr, Sylvia Bateman, LIS Eco-school adviser offered similar sentiment stating that, "It would not have been possible to have achieved our Green Flag without the determination and initiative of our eco- committee. 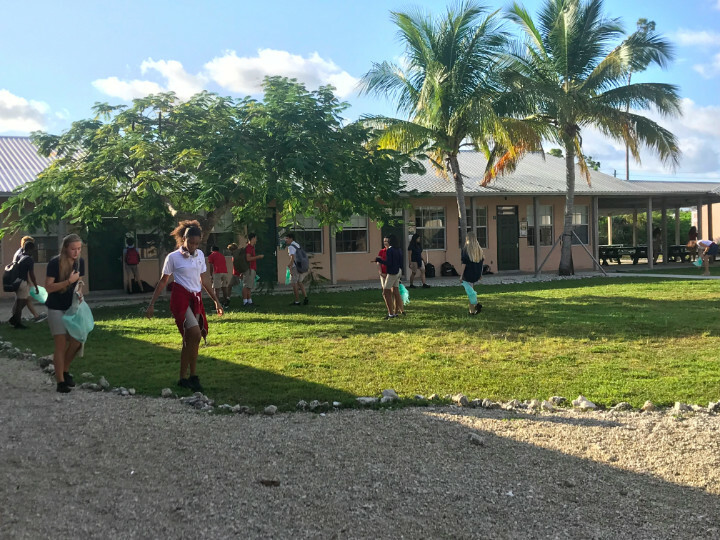 It has been a pleasure working with our Eco presidents"
The Bahamas Reef Environmental Educational Foundation (BREEF) runs Eco-Schools in The Bahamas and Eco-Schools Bahamas is part of an international award programme developed in 1994 by the Foundation for Environmental Education. Eco-Schools, which is based on the work of student-led teams, recognizes schools that make a commitment to continuously improve their environmental practice. There are currently over 52,000 Eco-schools in 68 countries. Through identifying and implementing solutions for environmental challenges in their schools, students drive a spillover effect into the surrounding communities. Students of each school’s Eco-club keep their campus litter free in fulfillment of the primary and most critical component of the ESB programme. Under their Eco-code, “Becoming more environmentally sound, so Warrior Land can be the best Eco-School around,” the Eco-club of BMES installed solar panels to help reduce the school’s energy bill. “With this initiative we believe that for every student that is impacted by this program here BMES, we would have touched our community in a very positive way,” said Mr. Curt Hollingsworth, Principal at BMES. FGCS appointed “Pollution Solution” and “Bright Ideas” student monitors to ensure compliance with their anti-littering campaign, “TO MAKE THIS SCHOOL GREEN, WE MUST KEEP IT CLEAN,” and electrical energy conservation initiatives. FGCS reduced their electricity bill by 44%. LIS students (front) Katelyn Cabral, Yr.11 (left) and Jessica Sykes, Yr. 11 (right) participating in a school wide cleanup initiative. Lucaya International School is reducing their use of plastic water bottles after installing reusable water bottle filling station that track the amount of plastic bottles not used each time students refill their reusable water bottles. According to LIS’s Eco-code, LIS is "Reducing our footprint one step at a time." LIS Eco-club Co-president Nina Sanchez said, "For me, the most rewarding part of Eco-school is seeing the entire student body getting involved with environmental initiatives like Tidy Tuesday." An elated LIS Co-president, Annabel Purvis said, “We have come such a long way since the beginning, so getting this Green Flag shows an incredible development of an entire student body in the last 5 years, and I couldn't be more proud of everyone involved. " BREEF is especially proud of the continued growth of the ESB programme on Grand Bahama through the invaluable assistance of Ms. Olethea Gardiner of Keep Grand Bahama Clean (KGBC). 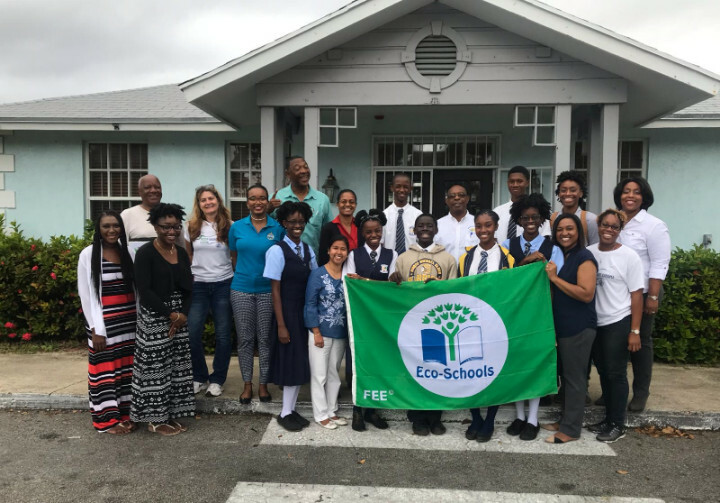 “The Keep Grand Bahama Clean (KGBC) committee is pleased to be a part of the Eco-School program, which focuses on youth environmental empowerment. 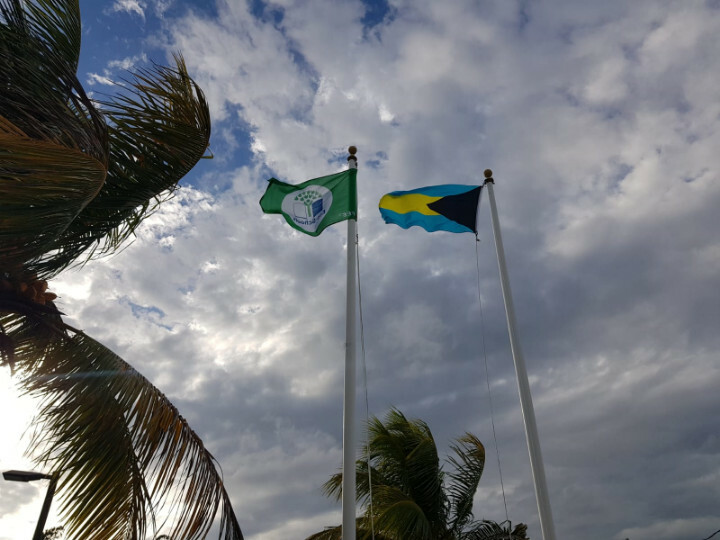 To see the achievements that these three schools have received on the island of Grand Bahama, all for the betterment of their school community, the KGBC committee wishes to congratulate the three schools on their hard work, dedication, and commitment. We continue to look forward to the innovative environmental initiatives expected from you, our future leaders,” said Ms. Gardiner of KGBC. Proud students of Freeport Gospel Chapel School getting ready to hoist their well-deserved Green Flag. LIS student and budding agriculturist, Jason Radakir, Yr. 9 proudly displays his future crop of vegetables. 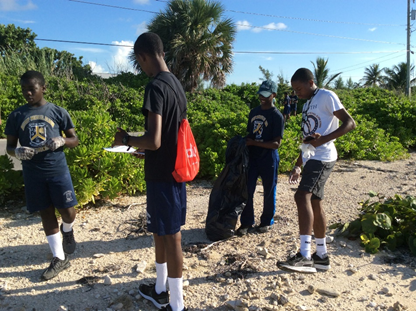 Eco-students of Bishop Michael Eldon School cleaning and logging debris collected during a coastal clean-up initiative.